In a large pot, add cut-up potatoes and just enough cold water until potatoes are covered; bring to a boil. Reduce heat to medium; cover and let simmer 15 to 20 minutes or until potatoes are tender when pierced with a fork. Overcooking can cause the potatoes to become gummy. Remove from heat and immediately drain potatoes thoroughly in a colander. Return to saucepan; heat over medium-low heat approximately 1 to 2 minutes to dry potatoes, stirring occasionally. NOTE: Boiled potatoes left in water will start to jellify and may even increase in volume (becoming swollen and watery). That is why it is important to let the potatoes drain for a couple of minutes in a colander immediately after they are cooked. In the same cooking pan, mash potatoes with a potato masher or potato ricer until there are no lumps. TIP: NEVER use a blender, electric mixer, or food processor to make mashed potatoes.Gluey or gooey mashed potatoes are caused by vigorous over mashing, When potatoes are boiled, their starch granules swell. If those granules are broken too vigorously, the cells release copious quantities of starch, resulting in a potatoes with the consistency of wallpaper paste. Add cream cheese, sour cream, onion powder, salt, pepper, egg whites, and chopped chives (if desired); blend well. Spray a large casserole dish with vegetable-oil cooking spray. Add potato mixture and dot with butter. Cool mashed potatoes slightly, cover, and then refrigerate. The prepared mashed potatoes may be made up to 7 days ahead of time. If preparing ahead, remove from refrigerator 30 minutes before baking. Place in an ovenproof baking dish if not already stored in this dish. Take potatoes out of the refrigerator 30 minutes before baking. Bake, loosely covered, 40 minutes or until steaming hot in center. You can use this crock pot/slow cooker version, if you need to free up your oven for other dishes when making my holiday meals. 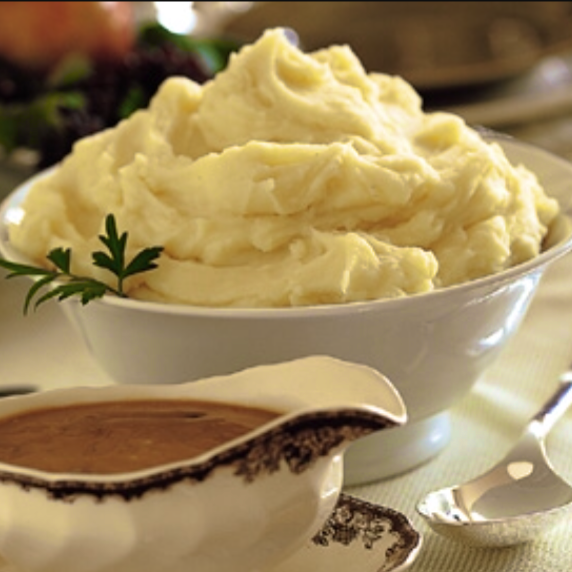 Take the prepared mashed potatoes out of refrigerator about 3 1/2 hours before serving time. See Preparing Make-Ahead Mashed Potatoes above. 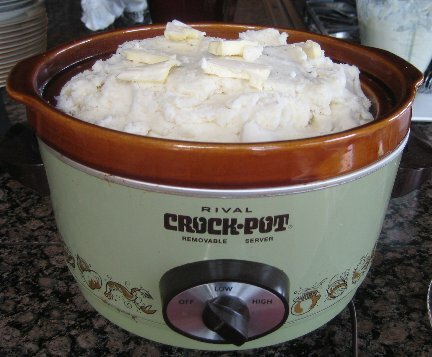 Place the mashed potatoes in the crock-pot/slow cooker. Cover and use low heat for approximately 3 hours, stirring once or twice. When you are ready to serve the mashed potatoes, stir, and then add some additional dollops of butter. I bake these cookies every year for the Annual Holiday Cookie Exchange at my girlfriend, Suzanne’s home. They are always a hit. One year I broke tradition and made a different variety of cookie. 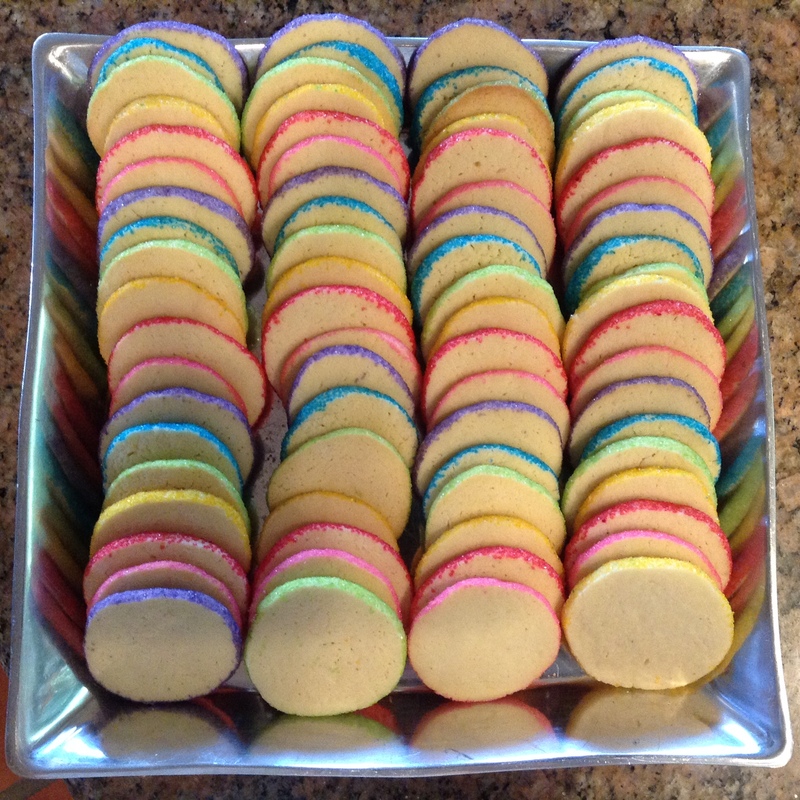 My friends missed the colorful treats and now they request Rainbow Rounds every year. They are a delicious sweet treat even in the morning with a cup of coffee. I sometimes change the color of sugars when I bake them during different holidays (Halloween – orange and purple; Valentine’s Day- pink and red; Easter – lavender, pastel pink and mint green). They are even fun to make using your favorite sports team colors. Enjoy! 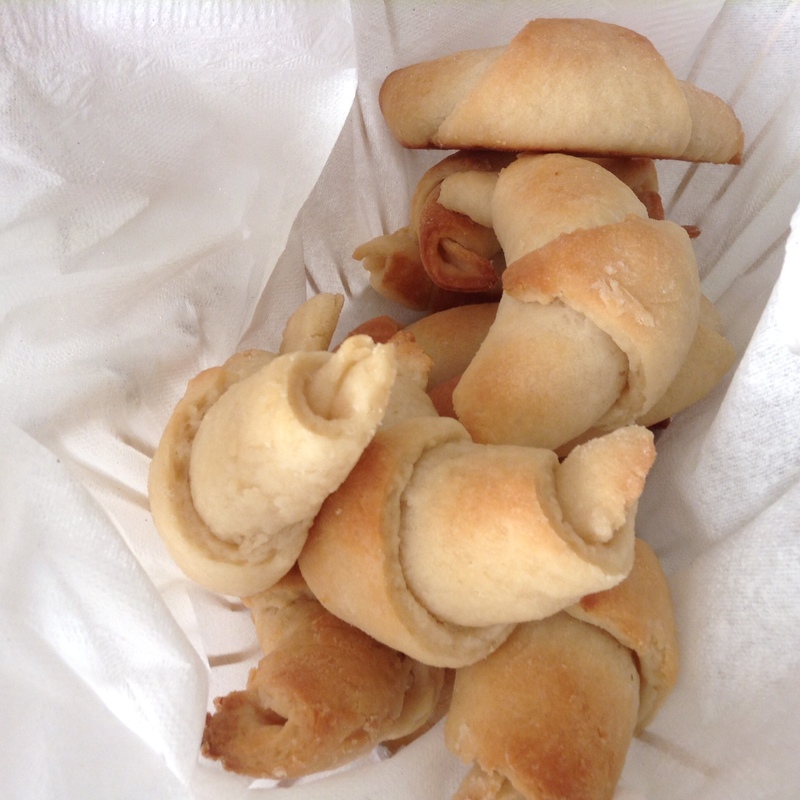 These buttery delicious crescent rolls are requested every year around the holidays by everyone in the family. My daughters look forward to baking them with my mom every Thanksgiving. 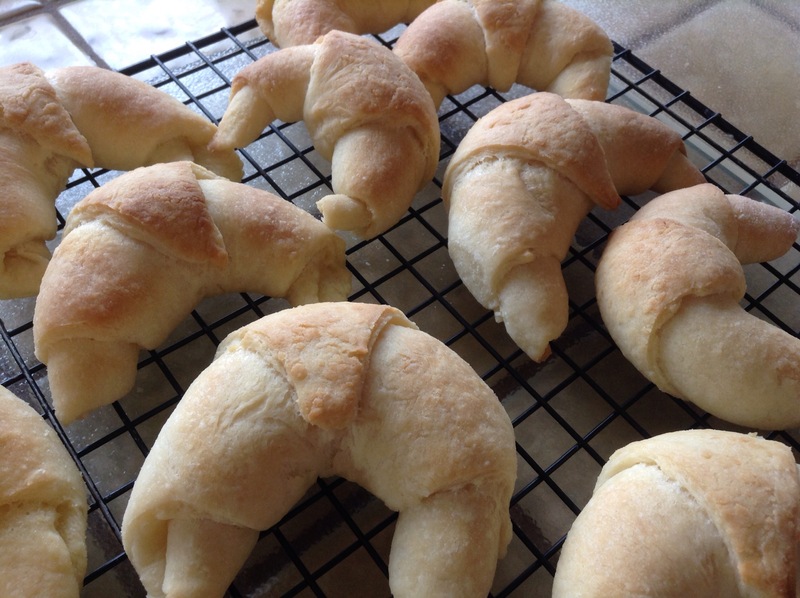 They are irresistible right out of the oven. Yummy! Break yeast into cold milk and set aside. Mix dry ingredients and shortening as if for pie crust. Beat the eggs well and add to milk/yeast mixture. Mix this with flour mixture. Set overnight to raise (doesn’t need to be especially warm). In the morning, divide dough into four equal parts and roll each out on a floured board or silicone pastry mat. Spread thin layer of butter onto entire round and then slice into 8 pieces like a pie. 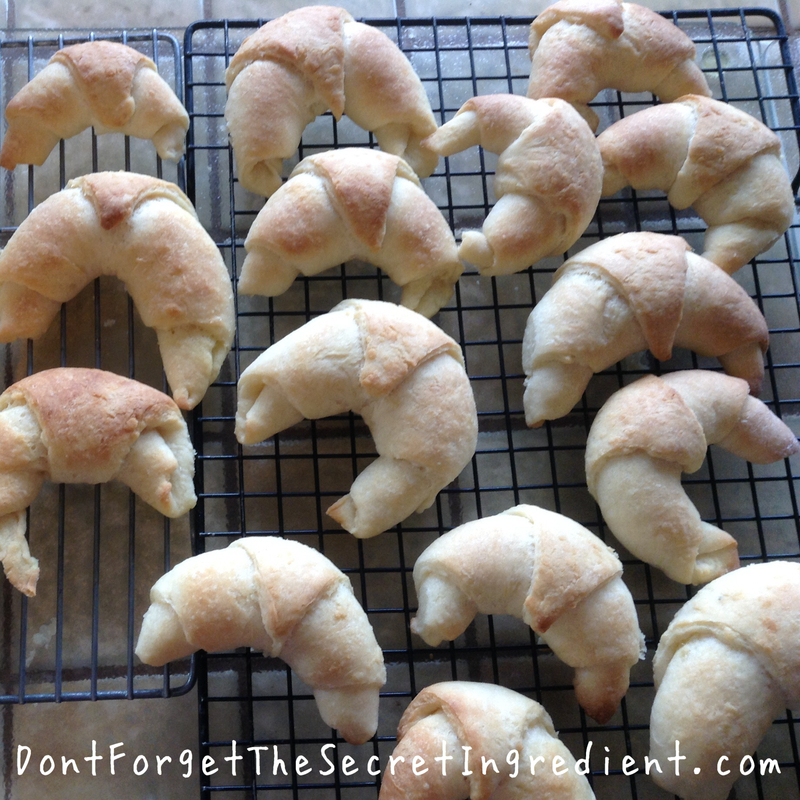 Roll each from wide end to small end and turn under placing on a cookie sheet. Let them rise again, covered with alight towel. Bake in 375-400 degree oven for 12-15 minutes.